Graeme Dey, MSP for the Angus South Constituency, was delighted to meet with staff at Sea No Waste in Arbroath on Thursday 11th October alongside the Scottish Government’s new Minister for the Rural Affairs & Natural Environment, Mairi Gougeon MSP. Sea No Waste offers a unique shopping experience for customers, promising that none of the items on sale will be sent to landfill. The store also offers assistance to local residents who are looking to reduce their household waste. The store hopes to lead the way for similar environmentally-driven businesses to thrive throughout Scotland. “It was a pleasure to meet with Sam and the team at Sea No Waste today. 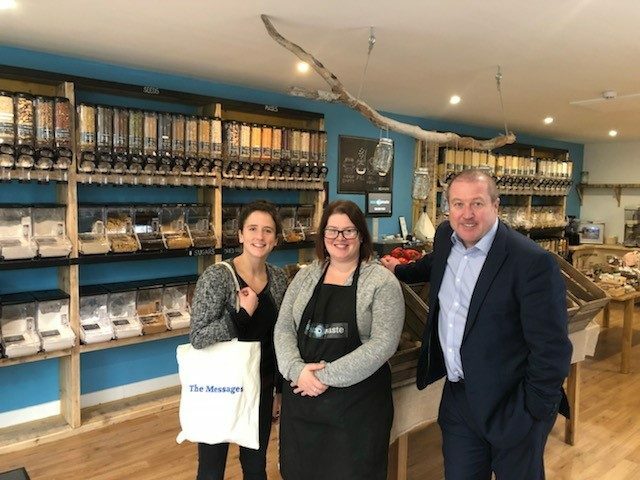 I was delighted to also welcome Natural Environment Minister, Mairi Gougeon, to witness first-hand the store’s efforts to combat pollution on our shores. “Our business at Sea No Waste is a way to say goodbye to single use plastics. We have made a way possible for our customers to shop in a guilt free way of preventing anything ending up in landfill or the ocean. Any packaging we do have in store is fully biodegradable. “Our store is like a step back in time, with brown paper bags and only buying what you need. This makes use very affordable for families and for anybody living on their own.